If you’ve secured your bike to any ordinary bike rack in the past then you have probably seen a Raleigh mountain bike or street bike before. There’s a reason why Raleigh has been such a trustworthy name in cycling over the years. The company makes its bicycles with the highest standards in mind and has been doing so since the company was formed in 1887. This Raleigh Tokul 2 review shows just the latest model for you to enjoy. The Tokul 2 mountain bike is just the latest in the extensive line of bicycles Raleigh Bikes has to offer. But what is it about the Tokul 2 that makes it a special model? Let’s look at some of the things that it comes with that makes it stand out so well. 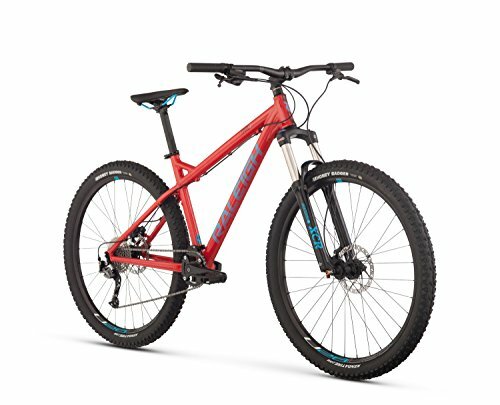 The drivetrain on this mountain bike is the first point to see as it works well for uphill and downhill activities and even for fast and slow speeds alike. It is a Shimano Alivio 1×9 drivetrain model. It produces several gears to help you move quickly. The shifting mechanism near the handlebars also links well to the drivetrain and helps you navigate through even the roughest mountain trails. Notice the immense density around the gear area as it produces the shifting support you require. The tires and rims on the Tokul 2 can handle even the toughest environments. The wheels start with 27.5-inch Weinmann U28 rims made with lightweight alloy components. The rums are produced to support the harshest roads. Meanwhile, the Kenda Honey Badger 27.2×2.2-inch tires work perfectly on many surfaces. The tires are thick and wide enough to keep a strong bike grip on even the hardest conditions. They do rather well in wet environments too, thus producing a safer and more affordable mountain bike ride. The hydraulic disc brakes on the Tokul 2 Mountain Bike are vital to its safety. Tektro hydraulic disc brakes are added to improve upon the bike’s stopping power in many conditions. The braking fluid on the inside is carefully organized to produce a strong ride. The friction produced is consistent and adds a comfortable texture that is not hard to use. This is important when you are using the Raleigh Bike on a downhill incline and you need to keep it steady as you move forward. Enjoy the comfortable ride on this cheap mountain bike with a smooth and easy to use the fork at the front part. The SR Suntour XCM fork uses a 120mm body. It comes with a lightweight alloy structure to add a comfortable ton. This keeps you from feeling too many bumps as you are out on the road. This pairs well with the strong tires on this model to produce a smooth and more enjoyable ride that adds to the excitement of the open trail. You will have a very easy time controlling this particular bicycle. The test ride pedals are easy to get a foothold on to. The Raleigh 200 Series MTB Riser is also great for offering a 720 or 740 mm size depending on the model you order. These sizes are enough to handle even the toughest riders. These pairs well with the 140mm seat plus the closed-end single lock ring grips. Each feature offers a comfortable ride that you can quickly handle well. The last feature to see on this bicycle is that it uses an alloy component around its body to produce a lightweight setup. The bicycle itself is only around 30 pounds in weight. The AL-6061 SL custom-butted aluminum body is a big part of what makes this work well. It is machined with compounds about 1-1/8” thick to generate a strong body that does not wear out but also adds a good surface that absorbs shocks to keep the ride enjoyable and run. The final verdict on the Raleigh Tokul 2 mountain bike is that it is a very useful and attractive bike to have on the road. This is a special model that offers a fun layout that is easy to ride on while also having a simplified control setup. You will enjoy using this bike for how well it can handle the road and keep you moving in even the toughest conditions. The gear system and strong braking layout both add a comfortable design that gives you more to work with. If anything, this Raleigh Tokul 2 review should have proven just how useful this bike is.